ISG Elastomers manufactures O-ring kits which are ideal for away sites, maintenance dept etc. These kits have assorted sizes of high-quality O-rings which comes handy during emergency replacements and reduces downtime drastically. All O-rings are manufactured from special multi-cavity flash-less tooling & regular compounds, hence there is no compromise in the quality of O-rings & yet our rates are very competitive. We can offer these kits in standard, metric & Japanese standard sizes in various polymers, Nitrile (NBR) & FKM (VitonÂ®) O-ring kits being ex-stock in our inventory. The above can also be manufactured in other polymers like EPDM, Silicone & Neoprene on request. Standard O-Ring Kits have 30 assorted sizes with total of 382 pcs. 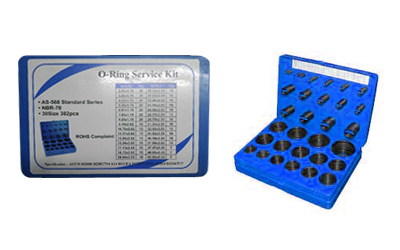 Metric (MM) O-Ring Kits have 30 assorted sizes with total of 386 pcs.